Every cabtyre cable has an anti-wicking block at the cable entry section on the pump. This mechanism is such that a part of each conductor is stripped back and the part is sealed by molded rubber or epoxy potting which has flowed in between each strand of the conductor. This unique feature prevents wicking along the strand of the conductor itself. A built-in thermal motor protection device reacts to the excessive heat caused by overcurrent or run-dry conditions. It not only cuts off the motor circuit automatically but also resets by itself. When the motor cools down to a safe operating temperature, the motor restarts. High-grade bearings for high-temperature operation are used. Also, as deep-groove, double-shielded C3 ball bearings are used, and as the bearings are permanently lubricated by grease, there is no need for injection of lubricating oil. Liquid paraffin is used in every VANCS series pump. It is a highly-refined pure oil generally used in the industries of cosmetic, pharmaceutical, and food processing equipment, etc. The use of this oil widens the applications of the pumps to decorative waterfalls, fishponds, and aquaculture, etc. A mechanical seal with two seal faces containing silicon carbide (SiC) is equipped with the oil chamber. The advantages of the seal are two-fold, it eliminates spring failure caused by corrosion, abrasion or fouling which prevents the seal faces from closing properly, and prevents loss of cooling to the lower seal faces during run-dry conditions which causes the lower seal faces to fail. The Oil Lifter was developed as a lubricating device for the mechanical seal. Utilizing the centrifugal force of the shaft seal, the Oil Lifter forcibly supplies lubricating oil to the mechanical seal and continues to supply the oil to the upper seal faces even if lubricant falls below the rated volume. This amazingly simple device is not only reliably lubricates and cools down, but also retains the stable shaft seal effect and extends the inspection term. In order to prevent "air lock", an air release valve is built in the pump casing. The valve is similar to a ball check valve. When air goes through the valve, the ball stays at the bottom, but when the pumped water starts to flow, it closes the outlet by its buoyancy. Unfastening the bolts between the oil casing and the upper pump casing allows the body to be separated into the pump section and the motor section with the impeller left in position. This facilitates easier inspections of the main portions.The pump section can be disassembled/reassembled using a cross slot screwdriver (excluding 0.15kW). A rubber foot is fitted on each stand of the pumps from 1.5 to 3.7kW and the PLS-series pumps. This prevents scratching of floor surface. 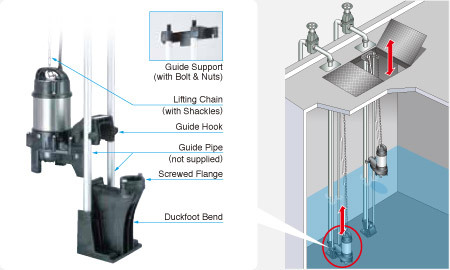 The TOK guide rail fitting system connects the pump to and from the piping easily just by lowering and hoisting the pump, allowing easy maintenance and inspection without the need to enter the sump. Made of high-quality resin, the TOK is designed for lightweight, small to middle sized pumps. 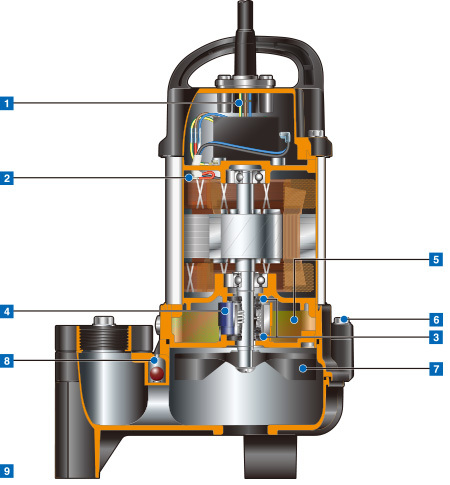 Rubber bellows attached to the guide hook are inverted to the duckfoot bend when the pump starts operating, and it seals by the pumping pressure. This eliminates leakage at the seal even if a lightweight pump is used in combination with the TOK. The TOK is available in all motor output ranges of the PU, PN, and PSF series. The float type automatic model has an integral control circuit and two float switches that operate at a low voltage. It operates automatically in response to the change in water levels. This model can be identified by the suffix "A" and is available in all motor output ranges of the PU, PN, PSF, and TM series. The cylindrical float type automatic model is available only for the OM-series. Adoption of the unique float switch has made even the automatic model very compact and enables it to be installed in a limited space. Automatic operation is possible with a simple power panel. The auto-alternation model is used along with an automatic model. The combinational use of these two pumps enables each pump to operate alternately without control panel. The auto-alternation model has three floats and can be identified by the suffix "W". Refer to model selection for availability and model numbers of the PU, PN, and PSF series. Water level rises and turns the Float #2 up. The Float #2 is activated but the pump does not start. When water level rises to Float #3 and the float is activated, the "W" unit starts. The "W" unit is discharging water (Water level falls). When water level falls to Float #2, the float is activated, and the "W" unit stops. The alternating circuitry deactivates the "W" unit for the next level rise. If inflow exceeds the capacity of "W" unit and the water level rises to Float #4, "A" unit starts. The next time the water level rises, Float #1 on the "A" unit is activated but the unit does not start until Float #4 is activated. The "A" unit is discharging water (Water level falls). When water level falls and Float #1 is activated, the "A" unit stops. At the same time, "W" unit becomes ready for operation for the next level rise. If inflow exceeds the capacity of "A" unit and the water level rises to Float #5, "W" unit starts.